This trip report is very overdue. This happened back in November, the day after Thanksgiving. I thought I’d put it up anyway to serve as a resource. We had a hike planned the week before. But when we woke up in the morning, one of my children was in tears at the thought of hiking. It turned out he was getting sick, and was feeling over-scheduled and needed a day at home. The other child was disappointed, and so was I (though I did enjoy a day at home to catch up). So I told the kids we’d try to plan a hike for the weekend after Thanksgiving. We enjoyed a lovely Turkey Day with family, spending the weekend at my parents’ place near Vancouver, WA. The only day we had for hiking was Friday, since Saturday we HAD to watch the Civil War game between the Ducks and the Beavers. Unfortunately, we woke up to rain. Annika felt strongly that she wanted to go somewhere with beautiful green trees and a waterfall. 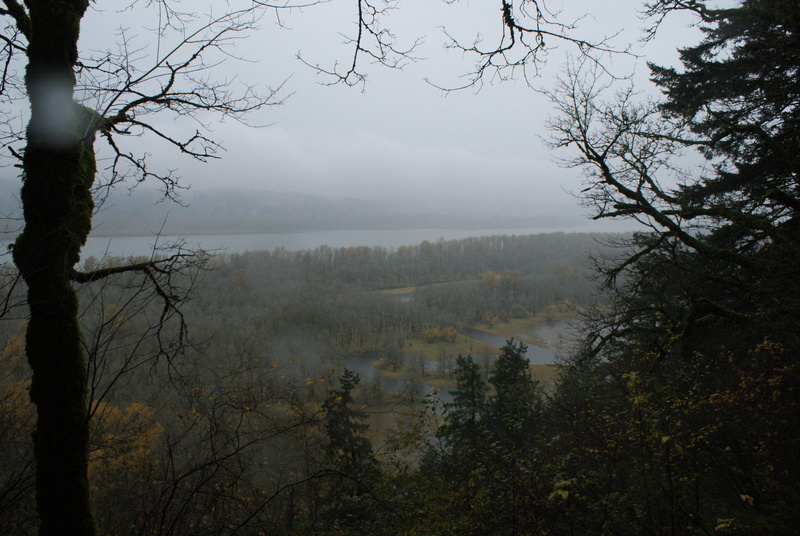 So we picked a short hike in the Columbia Gorge, knowing we’d get wet. We packed a bunch of food for the day, and extra clothing to change into. We talked my mom into joining us; she did know what she was getting into, but I think she had second thoughts with the weather! It rained pretty hard for most of our drive east out I-84. A few doubts did cross my mind, but I also knew this was our only chance to get out for awhile. 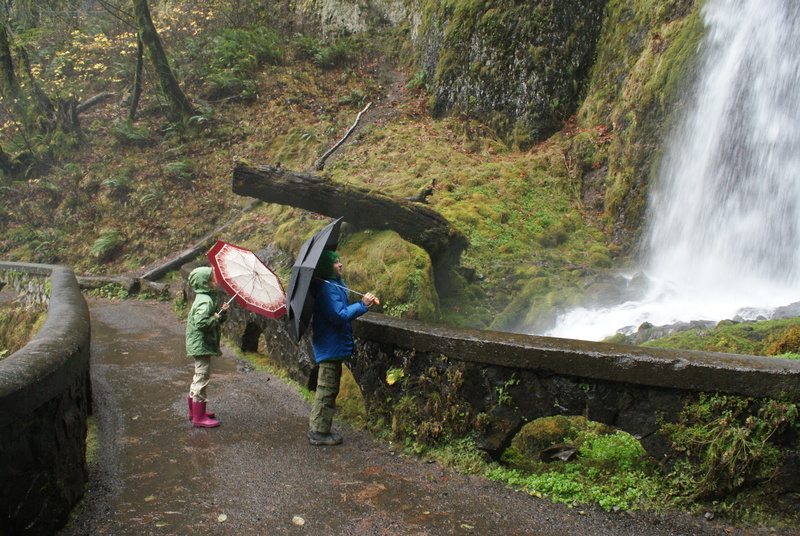 So much of hiking is attitude, and the kids said they were fine with a bit of wetness. We pulled off the freeway at one exit west of Multnomah Falls to take the scenic, winding old highway. 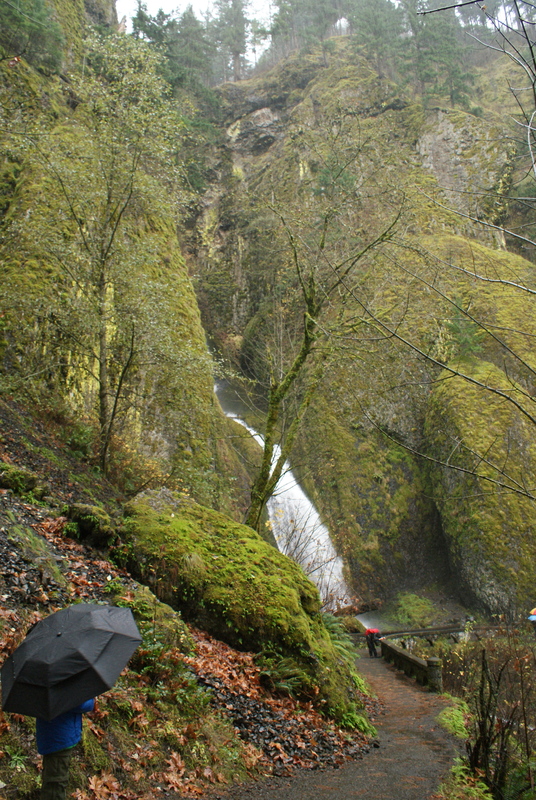 We soon drove by Wahkeena Falls, and parked in the lot to take a look. It had stopped raining for a moment, so we hopped out to view the waterfall, which cascaded not far from the road. There is a paved trail that switchbacks 0.2 mile up so that you can get a closer look at the waterfall. We walked up there, and it started raining again, but the kids had Grandma’s umbrellas to help shield them from the mist and spray. We enjoyed the old bridge next to the plunge pool, and stuck it out as long as we could before deciding we were wet enough. From there we drove the short distance to Multnomah Falls (you can also walk the 0.5 mile trail between them) and got out to view that magnificent waterfall. 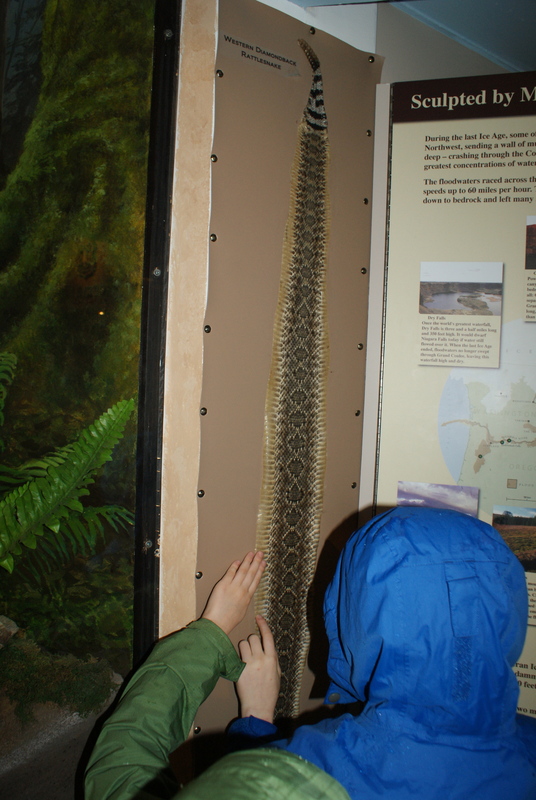 We stepped into the Visitor Center to ask about the hike I wanted to take, and I was pleasantly surprised to find some interpretive information there for the kids to look at and touch. 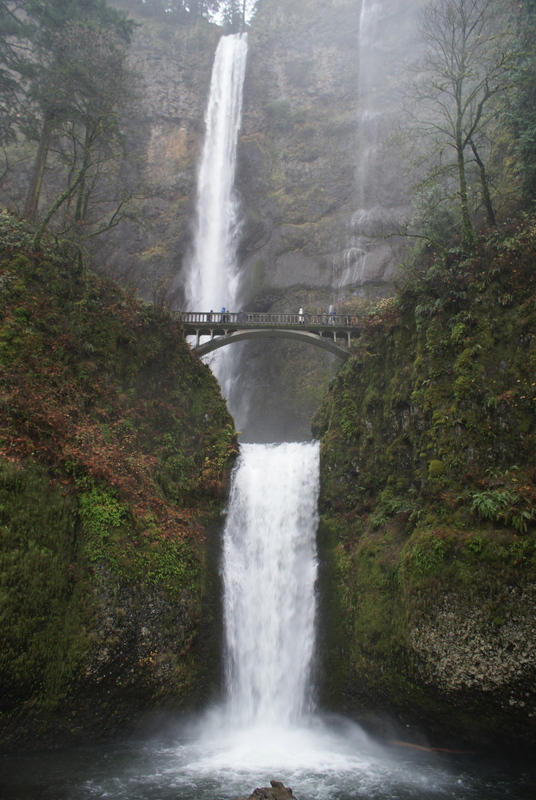 We learned about other waterfalls in the world that are higher than Multnomah Falls. And we picked up a trail map of the area at the book and gift store. 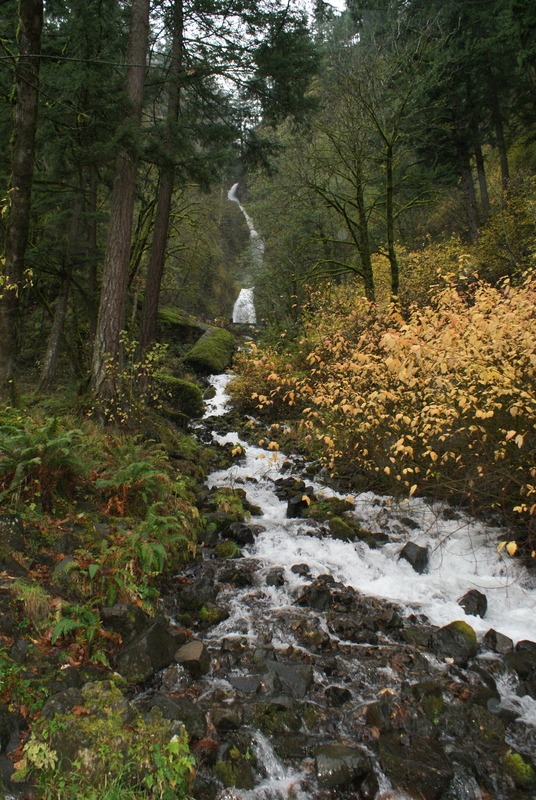 We looked at Multnomah Falls from the observation area, then drove up the road to the trailhead for Horsetail Falls. The trail leaves the old highway and immediately begins climbing up the southern wall of the Gorge. 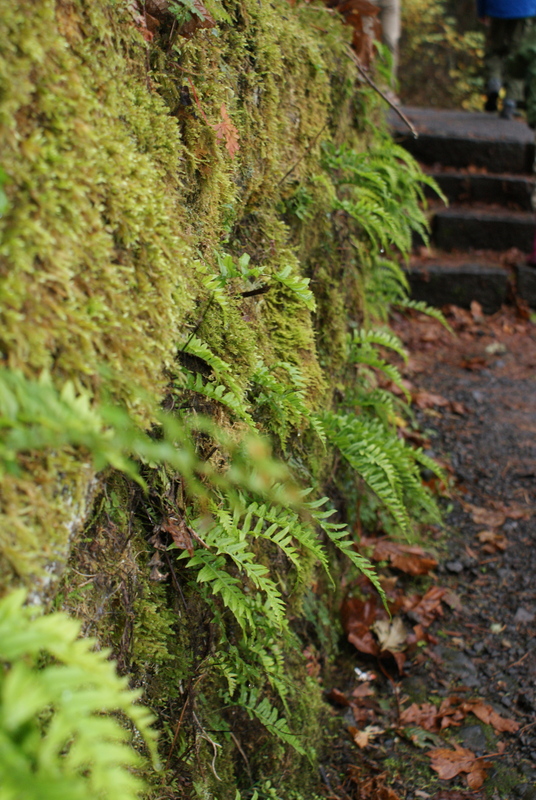 Ferns and mosses cover the stone walls with lush, cushy greenery. With the leaves gone off the maples, we could see a view up and down the Gorge when we got high enough. 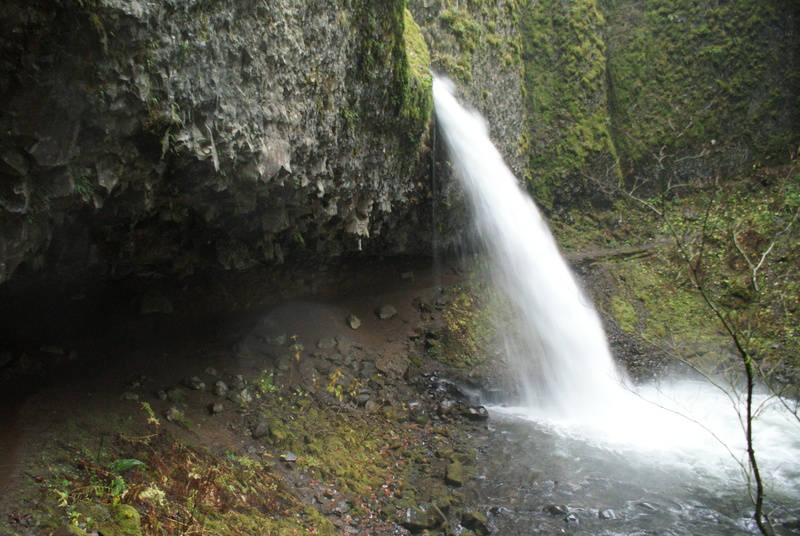 Once you get up to the views, the trail turns south along the creek, and soon you come to Upper Horsetail Falls. The falls comes off of a cliff, and the trail goes down behind the falls. The rush of water was loud and pounding over the edge. We sat in the shelter of the overhang and had some snacks and water. We were all soaked through to the skin. I was kind of disappointed in my jacket, but honestly the rain was so solid I don’t know how many jackets could withstand that kind of drenching. The walk down was just as wet. The light was fading when we reached the car, and tried to find a way to get out of our wet clothes and into dry ones without soaking the inside of the car as well. We drove home over the Bridge of the Gods, enjoying the Christmas light display in tiny Cascade Locks. This was one of those hikes where you know you are doing something crazy, but you also know you have to take advantage of the time. We all benefitted from the fresh air and exercise, and enjoyed having Grandma along for the day. 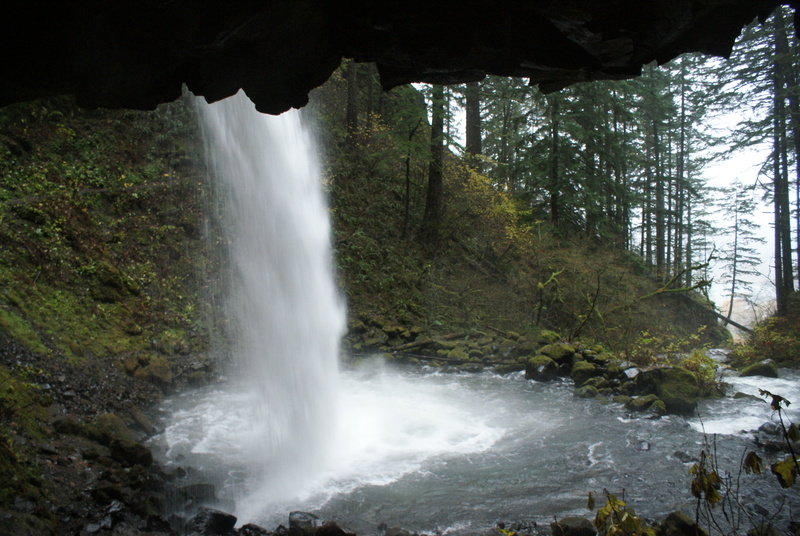 Find directions and information about Multnomah Falls and the Visitor Center on the Forest Service website. 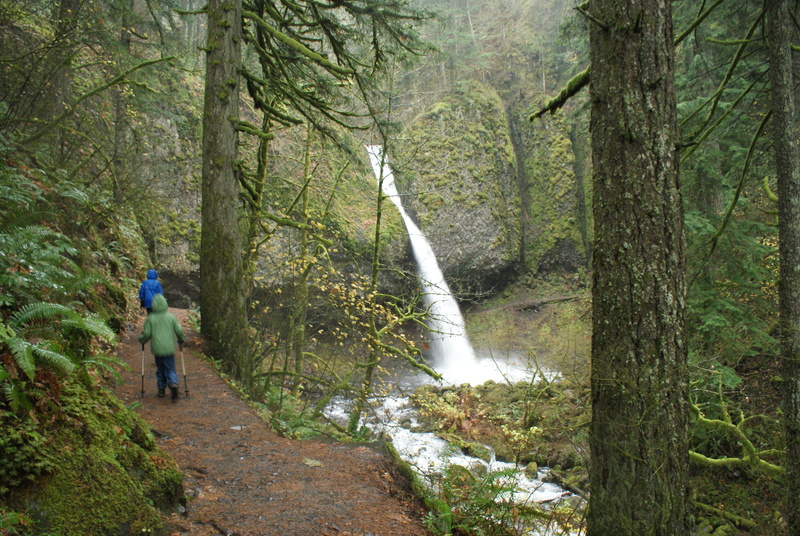 You will not need a parking pass at these waterfall trailheads. 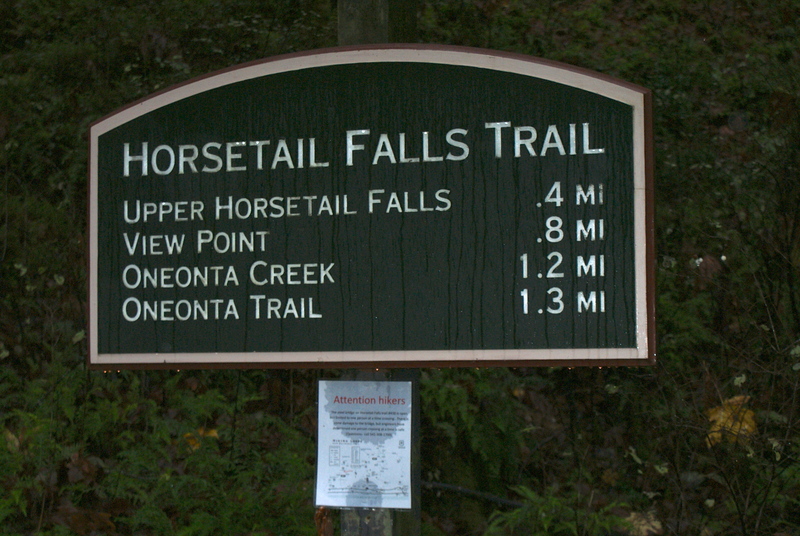 You can download a map with information about these trails here. 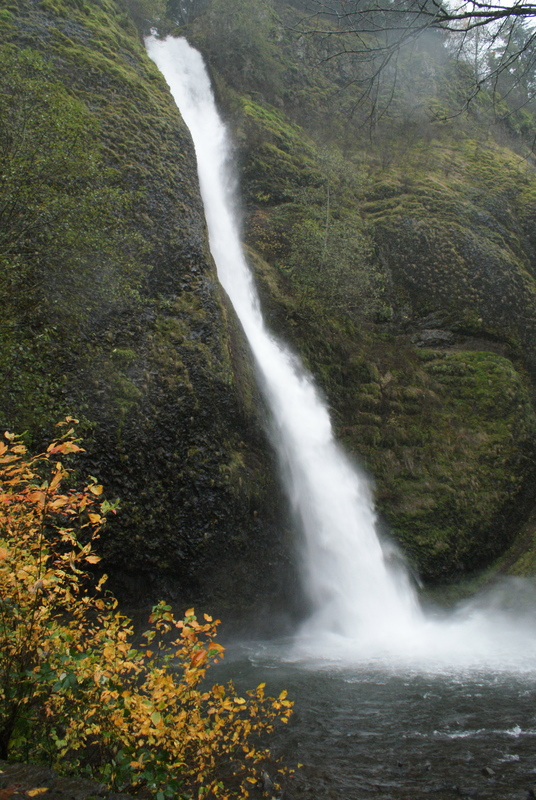 The hike to Upper Horsetail Falls can be extended to view more waterfalls. The other walks we did also are parts of longer trails and can make a loop if you want. 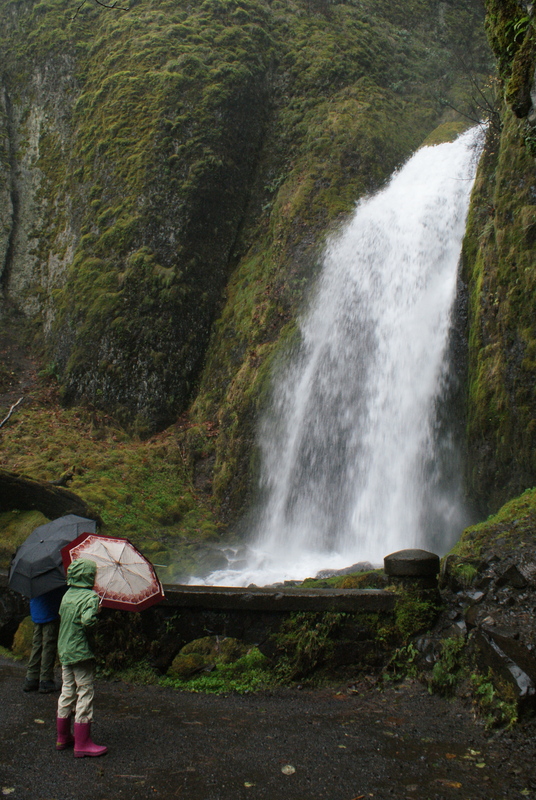 Check out a good guidebook (such as Craig Romano’s Day Hiking Columbia River Gorge) about the trails before heading there with your family or grandma, as some trails have steep dropoffs and dangerous portions not suitable for young children. The lodge at Multnomah Falls has food and snacks, as well as a restroom.